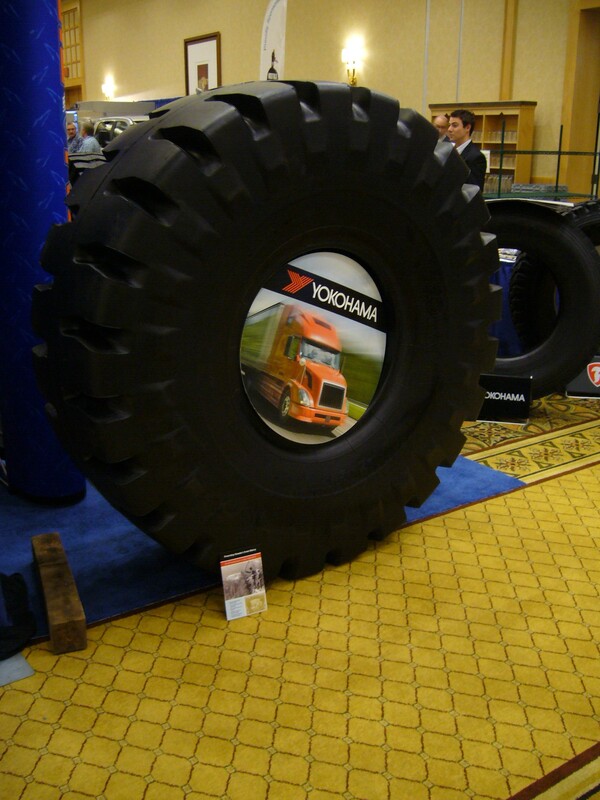 Tire, for sale at the 71st Truck Loggers Convention (with brochure on floor for scale). I’ve been reaching out to a wider range of communities that I imagine might have valuable (hidden!) Canadian forest history records. This is what inspired me to attend the 71st Truck Loggers Association and Trade Show, held in Vancouver this past January 15th through 17th. The UBC Faculty of Forestry had a booth in the tradeshow area, and Chiara Longhi, Directory of Student Services, was kind enough to let me set up shop at one end of the UBC table. I had my small stack of brochures (English and French) and I was wearing my most welcoming smile. Whenever I was asked for information about undergraduate forestry programs at UBC, I answered them the best that I could (read, not very well), before using my conversational ju jitsu to bring forest history front and centre. During the many long stretches when people were not approaching me to initiate conversations, I simply walked up to them and, with all of the smooth operator that I could muster, I worked the room. The delegates were mostly business people and contractors of various sorts. Maybe not surprisingly, it was a very male space. There were a number of cash bars scattered around the periphery of the trade show area, and booth exhibitors shared stories about the delegate who bought $600 worth of drink tickets to lavish on his friends and colleagues. The meeting was very 21st century with all of the smart phones and tablets, but at the heart of it, I convinced myself that the range of characters there were the younger offspring of those described by Martin Grainger in the first few chapters of his 1908 Woodsmen of the West. I say this in a very good way, you understand. However, given that there were over 1500 delegates, I didn’t need them all to be closeted history-philes. I just needed to connect with a few of them, and I did manage to track some of them down. Gerry Burch was a strong ally, for one. The booth for the Logging & Sawmilling Journal had a big display of old photos, calendars, post cards, stock certificates, license plates and the like. This moth was certainly attracted to that flame. There I met a collector, Tim Woodland. At first blush I feared that we might be in competition for the same records, he and I. On second thought though, I realized that the ephemera that he was after, did not necessarily describe the archival donations I was trying to encourage. The biggest revelation of the event for me was the Ritchie Bros auctioneers booth. I spoke with Wayne Jackson, ‘Territory Manager,’ for some time, perhaps much more to my benefit than his. Ritchie Brothers are the people who liquidate industrial sites when they fall into bankruptcy (“Buy and Sell Heavy Equipment with Confidence”). As such, they would be among the first on the scene when important decisions are being made about what can be sold for profit, and what is just junk to be thrown out. This is a great lead for me, and I will follow-up on it to see where else it might go (and what wonderful records it might uncover). The two days that I spent at the meeting were fascinating, and I had a number of wonderful conversations with folks from multi-generation logging families. I didn’t walk away with a bonanza of archival donations as I had hoped. Certainly no mother lode but there is still time for that. The truck loggers sent around a short electronic blurb about the Canadian Forest History Preservation Project, so I had to go home happy. The Canadian Forest History Preservation Project is supported by NiCHE, the Canadian Forest Service and the Forest History Association of British Columbia. If you have a lead on any forest history related records in danger of loss or destruction, please do get in touch. Hi David. Have you seen Frank White’s recent book from Harbour, titled “Milk Spills and One-Log Loads”? Its got one of the best accounts of early truck logging in BC that I’ve come across. Also, I think the Golden Museum was trying to do some kind of oral history on truck logging three or four years ago. Alas, haven’t had the chance to stop by and ask them what came of it, but it sounded like a cool project. And the Golden Museum isn’t on my list of repositories looking to expand their forest history holdings. At least, it wasn’t until right now!